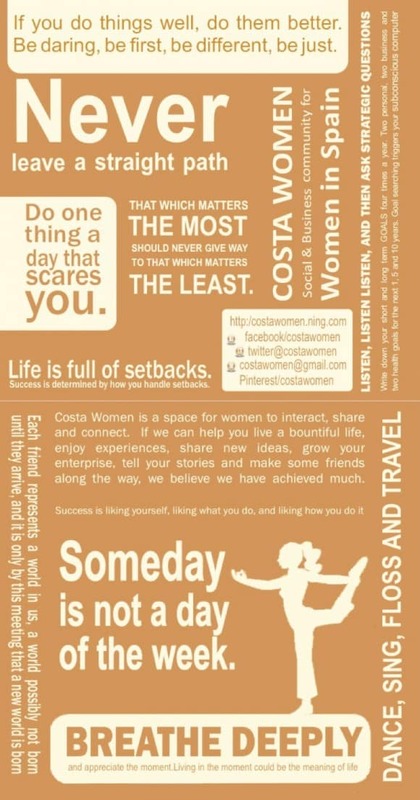 I am delighted to be partnering with the ladies of Costa Women for the 90 days of the tour. I have for many years been impressed by this group and I was delighted when they agreed to partner with me on my journey. The group was founded by the inspirational Ali Meehan and has grown from strength to strength from its humble beginnings on the Costa del Sol. It is now a truly national group and recently a Costa Blanca section started regular meetings in Torrevieja. In fact, at the time of writing there are now more than 3400 members throughout the country and the islands, as well as Women looking to relocate to Spain. One of the things I really like is that membership is 100% free. Respect to the ladies and I look forward to meeting many of them as I cross the country. Obviously, I cannot be a member but I have always tried to support their activities with publicity on www.ThisIsSpain.info , www.HotCosta.com and my other activities. In fact each and every Costa Women member is entitled to a free page on www.ThisIsSpain.info and/or www.ThisIsFuengirola.info at zero cost. Many of the members are personal friends and/or work with me on various projects.